In previous columns, I outlined the very fine work and support the Jewish Federation of Fort Worth and Tarrant County provides to the local Jewish community. The good news is that you have a chance to support the Federation (and the terrific community programs it sponsors) by donating on Tzedakah Sunday, Feb. 26. When the nice volunteers from the Federation call you, please pick up your phones … and donate. And, if you have the ability, a donation of time would also be terrific. The Federation is looking for Tzedakah Sunday callers and support volunteers to work three shifts at Congregation Ahavath Sholom, 4050 South Hulen Street in Fort Worth: 8:30 a.m. to 11:30 a.m.; 11 a.m. to 2 p.m. and 1:30 p.m. to 4:30 p.m. If you’re interested in helping, call the Federation at 817-569-0892 or contact Tzedakah Sunday chair Cindy Simon at c.simon@tarrantfederation.org. Those participating will be fed and will received prizes … and from what Cindy hints at, surprises as well! Federation program director Angie Kitzman tells us that the 2012 Campaign Kick-Off on Jan. 29 at Shady Oaks Country Club in Fort Worth was a success. The Major Givers’ reception was very well-attended as was the event itself, a presentation by Susan Sher, First Lady Michelle Obama’s former chief of staff. 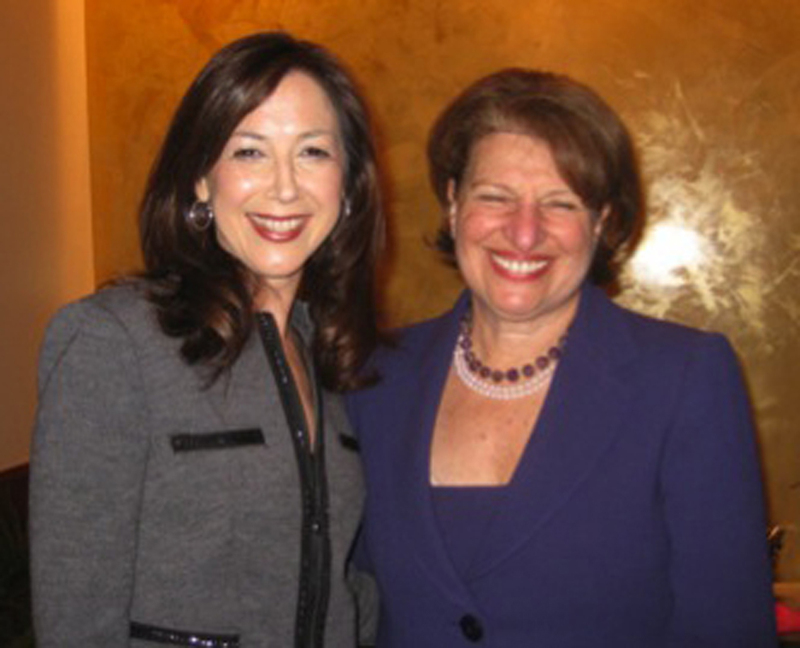 Sher was a wonderful speaker who provided some great anecdotes about life at the White House, including an amusing story about the first-ever White House staff seder. The event was capped by a lovely dessert reception. 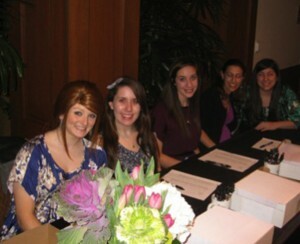 Membors of Alton Silver BBG, (from left) Leah Vann, Courtney Smith, Carli Clay, Dorie Kaye and Emily Englander at the Federation Kick-Off event. 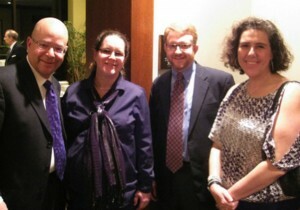 Marilyn Englander, Jeff Hochster, Jane Cohen and Linda Hochster spearheaded the evening. Special thanks as well to members of Alton Silver BBG — Leah Vann, Dorie Kaye, Emily Englander, Carli Clay and Courtney Smith who helped make this event possible. 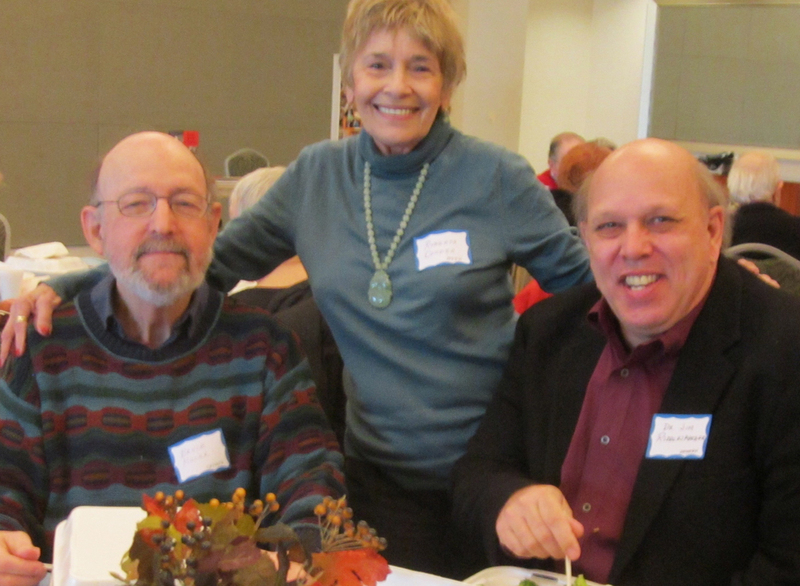 The Sylvia Wolens Daytimers program at Beth-El Congregation is one of many organizations benefitting from the dollars raised by the Jewish Federation. 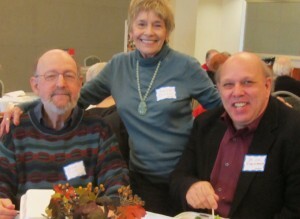 Attendees at the Feb. 8 Daytimers luncheon were treated to political expert James W. Riddlesperger, Jr., who sliced and diced the political muddle that we are facing for the 2012 elections. He received questions at rapid fire that lasted half an hour after he finished speaking. Next month’s Daytimers attendees will be treated to swing dancing, courtesy Chandler Smith, TCU development director, and Angelia Williams, petroleum land manager for Thurston Energy. They have taught swing dancing at many venues throughout the Metroplex, as well as on a variety of cruise ships. I’ll have more information about the date and time in a future column. Don’t forget to be in attendance at Congregation Ahavath Sholom beginning at 6 p.m., Friday, Feb. 24. Following Kabbalat Shabbat, the choirs of Arborlawn United Methodist Church and Rising Sun Baptist Church will pay a visit to sing musical selections composed by Rabbi Gary Perras’ father, Cantor Hyman Perras. Membership of both churches has been invited to attend so they can hear their choirs. Help CAS celebrate Brotherhood Month by attending what is sure to be a lovely presentation and service. Chabad of Arlington will help kick off the season of hamentaschen and groggers with a couple of “Coffee and Kabbalah” sessions. The first, a women’s night out event, will take place at 7:30 p.m., Thursday, March 1, during which the discussion will focus on Kabbalah of the Hamantaschen and the activity will include an interactive dessert demo with Sherlock Spice (where, I assume, hamantaschen will be prepared). Wine and dessert will be served, with suggested donations at $15 per person. Sponsorships are also available for $36. A few days later, on Tuesday, March 6, Coffee and Kabbalah will focus on the mysticism behind Purim. All activities will take place at 2136 Lindblad Court in Arlington. Also in Arlington, Congregation Beth Shalom will present the “Great American Purim Play” at 7 p.m., Wednesday, March 7 at the synagogue, 1212 Thannisch Street. The nine-sketch play was penned by Emmy-Award-winning writer Richard J. Allen (author of “Parashah Plays” and a writer for “As the World Turns”) and takes Esther and Mordecai, Haman and Ahasuerus through the prism of time, giving the Megillah a different twist. The event is open to the community and a hamantaschen party will follow. Questions? Call 817-860-5448. Last week, I made a request that readers send notices about weddings, b’nai mitzvah, trips, travels and other types of community news. I will KEEP making that request because this is what “Around the Town” is about. Certainly it’s about community activities. But it’s also about YOU, the Tarrant County Jewish community. When Rene Wisch, of blessed memory, wrote this column, she regularly wrote about reader news of interest. Help continue that tradition by sending your news to awsorter@yahoo.com.